I don’t get many opportunities to be classy. It’s (arguably) not that I’m actively classless, but when you spend your days cooking, cleaning and plonked in front of a computer, it’s hard to feel glamorous. Nobody wants to see me hanging up washing in a ball gown. So, when I want to feel classy for a change, I make canapés with a glass of wine in hand (there’s no other way). 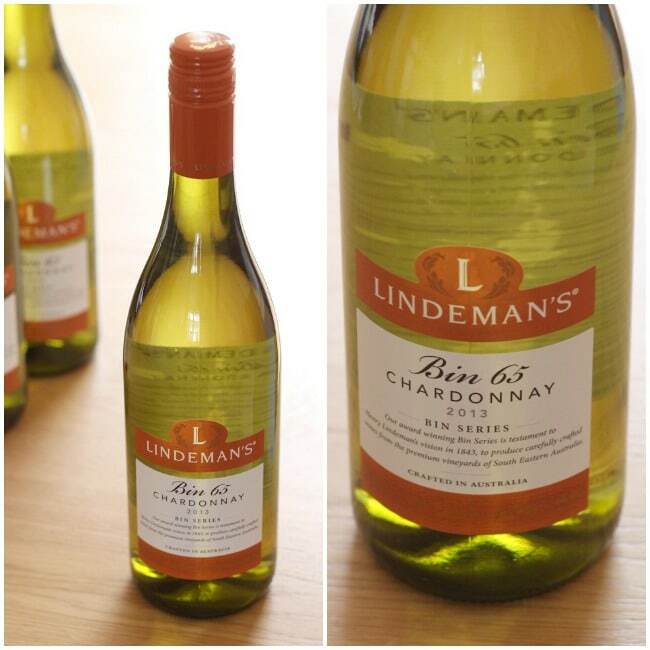 This Bin 65 Chardonnay from Lindeman’s was just the thing. 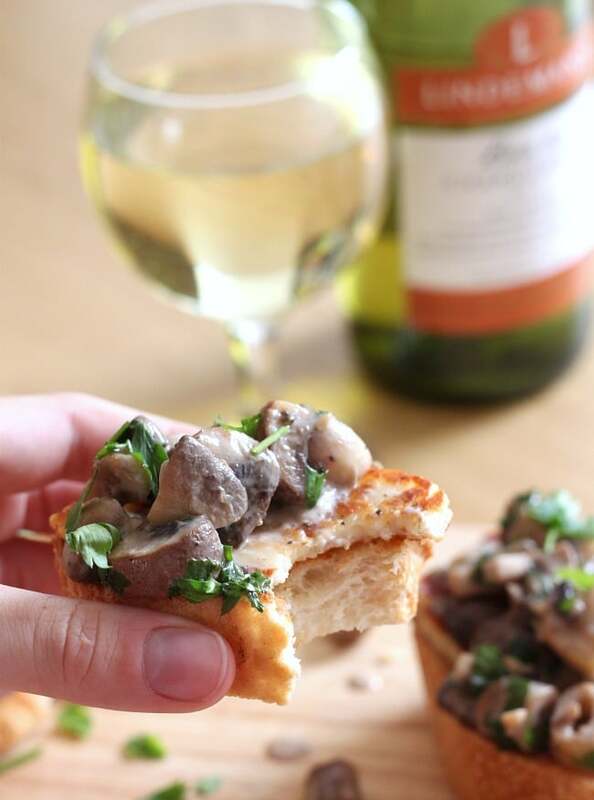 To prevent myself from drinking the whole bottle (which probably would have reduced my class factor considerably…), I put it to good use in these little mushroom bruschettas. Because only classy ladies make canapés, right? 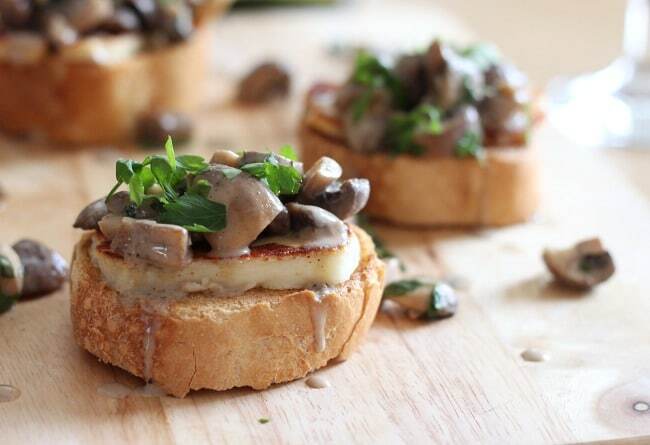 The flavours in these mushroom bruschetta were to die for. Mushrooms + garlic = amazing. Mushrooms + cream = amazing. Mushrooms + parsley = amazing. 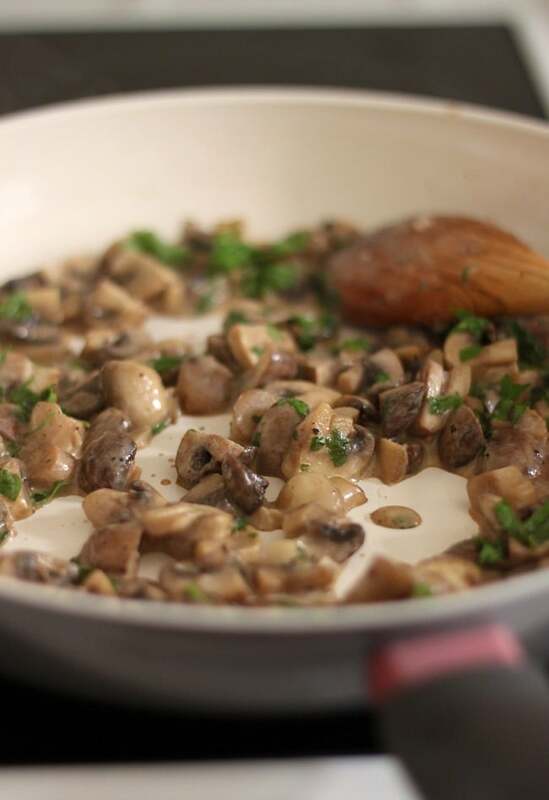 Mushrooms + garlic + cream + parsley + white wine… amaaaaazing. I drizzled the creamy mushrooms mixture over a slice of perfectly grilled halloumi, and sat the lot on a crispy piece of baguette. 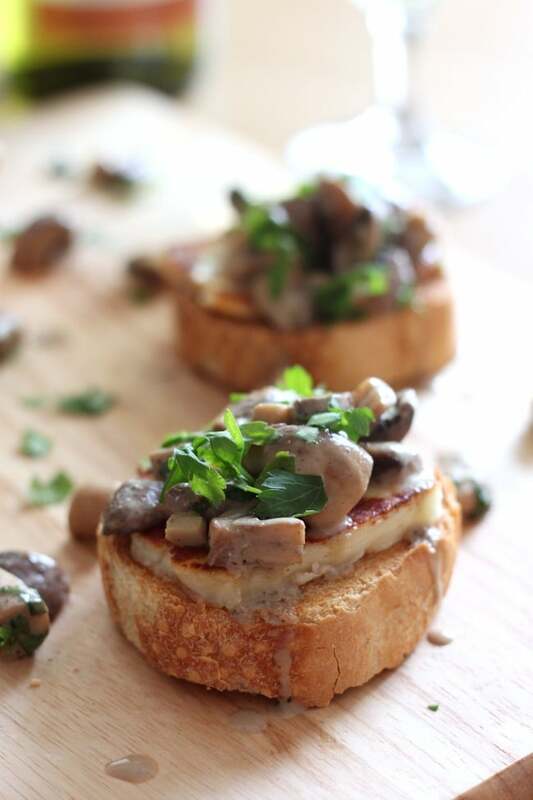 These mushroom bruschetta (which, by the way, is actually pronounced ‘brusketta’, not ‘brushetta’… I’ve been saying it wrong for years) may look fancy, but they were really easy. You just need to cook off your mushrooms with plenty of garlic, add the wine and a dash of cream. Then pile it all up with your halloumi, and hey presto, you’ve got canapés. 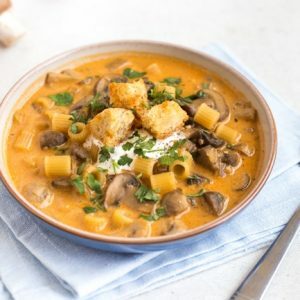 If you wanted to use this white wine-mushroom-cream mixture for an alternative purpose (it would be amazing on pasta), just don’t cook it for as long, so it ends up a bit saucier. Now, I’m no wine connoisseur, but the Lindeman’s chardonnay was beautifully fruity, and went so well with the salty halloumi. The wine also really lifted the creamy mushroom mixture and helped it to feel really light and summery. By the way, if you do serve these canapés at a dinner party, make sure you save yourself a glass of the wine for after your guests have left. Kick off your shoes and unwind… the washing up can wait until tomorrow! Heat the olive oil in a frying pan, and add the mushrooms and garlic. Cook over a fairly low heat for 5 minutes, until the mushrooms are soft. Then add the white wine, and bring to a gentle simmer. Cook for a further 5 minutes, until there isn't too much excess liquid left over. White the mushrooms are cooking, put the slices of halloumi in a single layer in a different, dry frying pan, and place over a medium heat. Cook for around 5 minutes - the halloumi will release some liquid, and once this liquid has cooked off, the cheese will begin to brown. When the underside is nice and golden, flip the halloumi slices over and repeat with the other side (note: this side will cook a lot more quickly than the first side!). Place the baguette slices on a baking tray and grill (broil) for a couple of minutes each side, until golden brown and crispy. When the white wine has cooked right down, add the cream, and cook for a couple more minutes until the sauce is thick. Add the fresh parsley, and season with a touch of salt and plenty of black pepper. To plate the bruschetta, add a slice of halloumi to each piece of baguette, and top with the mushroom mixture and extra fresh parsley. Serve immediately. Fan of mushrooms? 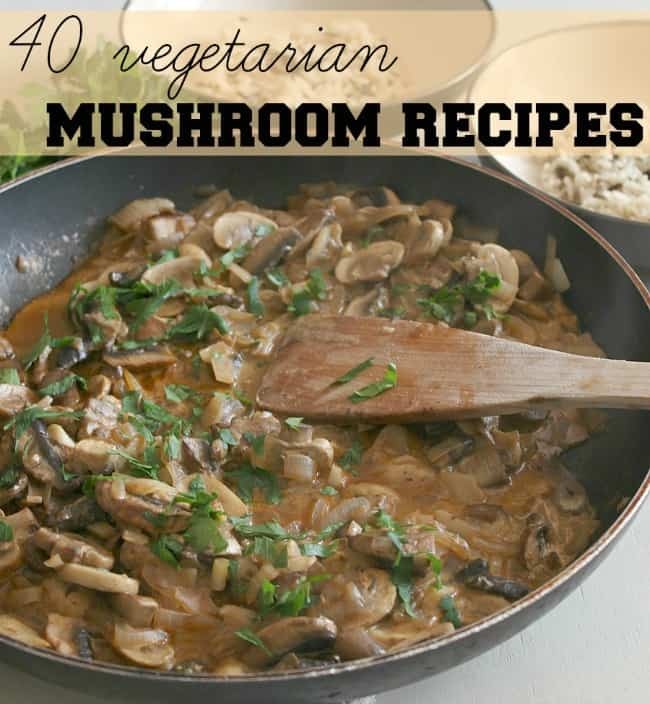 Have you checked out my collection of 40 vegetarian mushroom recipes? Wow! Really loved it. 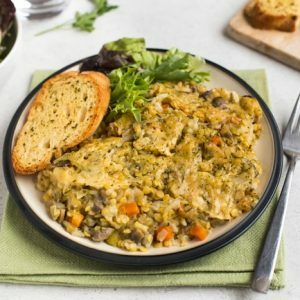 What do you think about only one tbsp olive oil? I think it’s too little amount. These went down so well last year that I have been asked to do them for our Christmas dinner starter again, now there an accolade to be proud of. Absolute winner. Went down a storm. 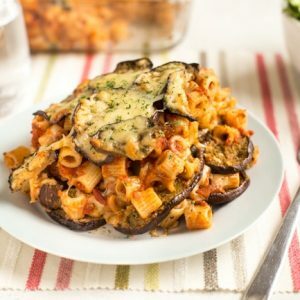 Any other suggestions for the mushroom topping? It was quite exceptional! Other ingredients acquired (already had the halloumi) so it’s officially our Christmas starter tomorrow. I have a few fussy eaters coming so should be interesting to see how it goes down. After further consideration… The baguette will offer the textural crunch I was thinking of. So that just leaves the question- Do you think this will work as a Christmas starter? Hi Becca, looks great! I want to do this as a starter for Christmas dinner. 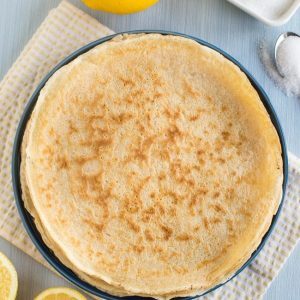 I see a lot of recipes which roll the halloumi in flour and fry in oil. In your opinion- ok as a starter? And flour and oil? Any views? Totally drooling over this recipe. Your photos are amazing as always too!! Consequently yummy! That looks irresistible. Oh my goodness this looks amazing! I want! These look great and Lindeman’s is a good Aussie drop to have with them. Can’t go wrong mushrooms, wine and cream. Thanks for letting me know about the cheese. I hope I can find it in the States. My weakness is cheese — I love it!! And the way an Italian pronounces biscotti is ” bee skoat ee. ” with a long o. I think it was Starbucks here in the states that started the trend with calling it the other way. 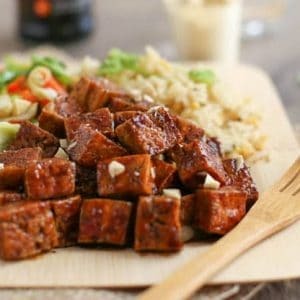 What is halloumi? I suppose I’ll look it up and your bruschetta (pronounced correctly- I’m Italian) looks amazing and I’ll definitely make it with halloumi once I find out what it is. BTW how do you pronounce biscotti? That’s another one of my pet peeves for mispronunciation. 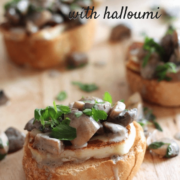 Halloumi is a Cypriot cheese, and it’s my absolute favourite – you must try it! 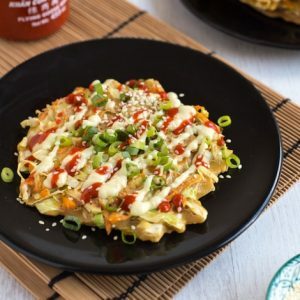 It’s quite salty, and you can grill or fry it without it melting all over the place. 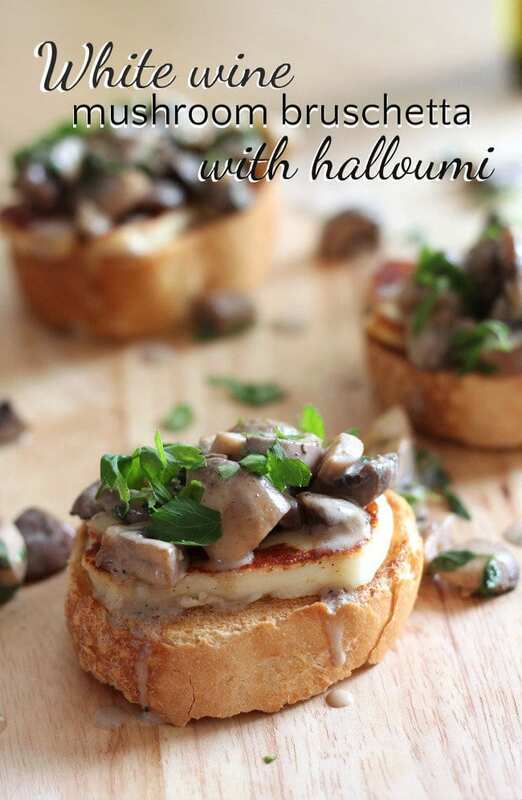 What a great way to use halloumi. 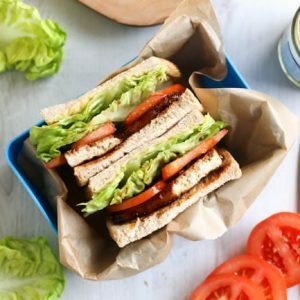 I love halloumi and I’m always looking for new ways to use it. Becca, these look incredible!! You’re very right, that combo, amazzzzing!!! Cheers to bring classy with canapés! Love em!